Despite providers' push for paperless delivery, research shows nearly 75 percent of all transactional communications (bills and statements) are still being delivered to U.S. households by postal mail. It's a clear indication that consumers still want the choice to receive sensitive documents through the U.S. mail, and security is among the top three reasons why they do. Who can blame American households from shying away from what seems to be a less-than-secure technology? Every day, hackers from all over the world seem to be able to invade technologically advanced sites like British Airways, GovPayNet, Newegg, and Independence Blue Cross, just to name a few recent ones. Even Facebook announced they had 90 million user accounts compromised by hackers in 2018. And it is increasing at an alarming rate. According to the ICO (Information Commissioner’s Office), data breaches have increased 75% in the last two years. Right or wrong, it makes the internet a scary place for many consumers. Until recently, most billing and invoice software developers were unable to offer a print-to-mail solution for their software users. Offering a traditional print and mail service was too expensive to operate as a standalone service. This was particularly true for low volume/high frequency applications. But not anymore. Snail mail and electronic billing are now just two sides of the same coin. Software providers and accounting services can now offer both, and let their users decide right on their print menus. Does that resemble an additional layer of cyber insurance? Not in the form of a policy. But companies that have taken legal precautions to protect themselves from data breeches still wind up with a public relations disaster in the event their email server is hacked. Not offering alternatives to electronic billing takes the decision out of your customers’ hands and puts the responsibility back on you. The DocuSend API reduces your possible exposure by providing software users with the ability to mail their sensitive documents through the U.S. Postal Service. So yes, you can think of it as insurance—if something happens, you want to be able to say you offered the option, but the client chose to use email instead. Our DocuSend REST API is actually a cloud-based mailroom that your users pay for only when they need it. That’s right: zero overhead. And it is every bit as fast to upload a file for mailing as it is to send an email. Almost all businesses have clients that are reluctant to open attachments for fear they may contain malware or a virus, even if they are familiar with the sender. And who can blame them? Hackers are getting more and more sophisticated at cloning email addresses and websites. That's why more and more companies are blocking all incoming emails with attachments that are sent to their employees. A far worse scenario is when security is breached. We have all recently witnessed the viral press coverage that can occur when sensitive data is exposed. The damage to an organization's reputation can be harder to recover from than the legal repercussions. 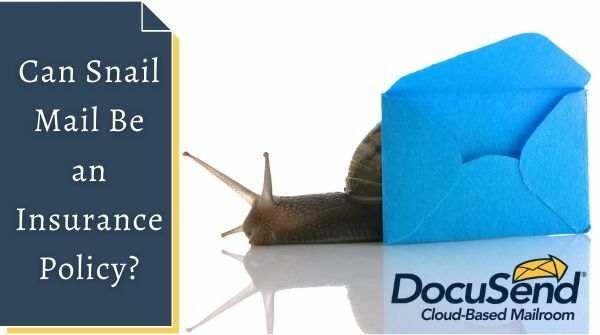 We invented DocuSend’s cloud-based mailroom to complement electronic invoicing, not compete with it. In addition to invoices and billing statements, it’s commonly used for mailing documents that are triggered by an unscheduled event. Shut-off notices, renewal or welcome letters, mandated notifications, legal notices, and product recalls are just a few examples. DocuSend's print-to-mail API solution is some of the least expensive ''insurance'' you’ll ever get. Implementing a ''Send U.S. Mail'' button or drop-down menu option can be integrated in days, not weeks or months. DocuSend’s enterprise mailroom is a fully supported revenue-generating REST API, and integration is free. No cost, no risk, and generates revenue for you while providing a valuable service for your clients. How’s that for an insurance policy? ✅Let our experts take you through the process. Learn more.